I don't know about you, but this time of year my fridge is overflowing with fresh fruits. There is nothing better than delicious summertime foods! Strawberries, cherries, blackberries, watermelon. It's all good! My family doesn't need any encouragement to reach for those fruits for snacking, but sometimes we like to kick it up a notch. I actually have a little chocolate fondu tower that I'll let the girls use with their fruits every now and again, but only for a once in a while treat as we do try to keep snacking on the healthy side around here. So, I was pretty intrigued when I found a recipe for Apricot Fruit Dip on Golden Blossom Honey that I thought would be a tasty and healthy way to add a little more flare to our fruits! It's a light, tangy dip that is perfect for summer entertaining. The coconut gives it a tropical flare that is so tasty, and pairs well with a multitude of fruits. What's your favorite summertime fruit? Ok, so that is pretty awesome. I am pretty sure I NEED to make this. I LOVE strawberries. Blueberries are a close second, but I love strawberries in the summer! That looks so good. 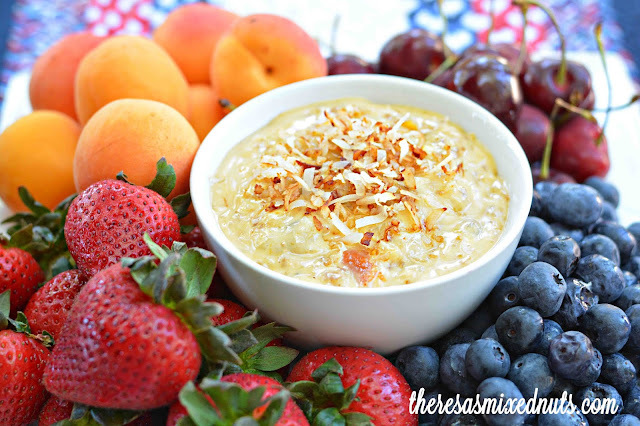 I love fruit dip, and the toasted coconut is a nice touch! Ok, this looks amazing. I have never had apricot dip, but I am sure going to make some now! I'd love to make some of this delicious dip. I love apricots and the chopped coconut sounds good too! I'm really into walnuts right now as well. ooh that sounds REALLY good. Especially on chilly fruit in the hot weather we've been having. This is getting pinned, stat! I would totally try this, thanks for a dip idea that is good for you, really! I will have to see if I can't use this to help me get some more flavors into my diet! Apricots are good for you indeed. Oh this dip looks so super yummy and I really like the added coconut. I truly love all kinds of fruit but would have to say watermelon takes the top spot for me. This sounds absolutely delicious. I love apricot anything. I love eating anything with apricots. It sounds like the perfect dip to entertain with. Apricot may actually be my favorite summer fruit! My husband doesn't care for them, but that just means there's more for me! Strawberries and watermelon! Our family could live on them. When it's too hot to turn on the stove/oven we will eat watermelon for dinner! That seems so tasty and cool. At this time of year, when it is so hot, I am all about a nice cool recipe with some delicious fruit, like apricot! That looks really yummy! Personally I am a HUGE fan of watermelon! My favorite summer fruit is watermelon! This dip looks delicious. That sounds perfect right now. I use honey for all my sweetener needs. There just aren't enough apricots in my world. I need to fix that..and fast! This looks so great. I used to hate coconut as a kid. Now I love the stuff! I can't get enough of it. Apricots are yummy to! I need to make this for my Hubs. He has given up cane sugar and is trying so hard never to go back. This looks like a delicious dip, perfect for a summer snack! That dip sounds wonderful and I wouldn't feel guilty about eating it! During the summer I love blueberries - they are so delish! Looks yum for a summer snack! I love dried apricot...it's great with the wine and cheese too ha ha.. Your presentation is amazing. Would you believe I never had an apriot before?? Putting those apricots and strawberries around the bowl is cheating! never try this before and how exciting to mix all those fresh ingredients..
Now I've had all kinds of fruit dip but never apricot. I need to try this asap! This would be perfect for brunch. This sounds so delish. I will have to make that to go with my apricot tea.